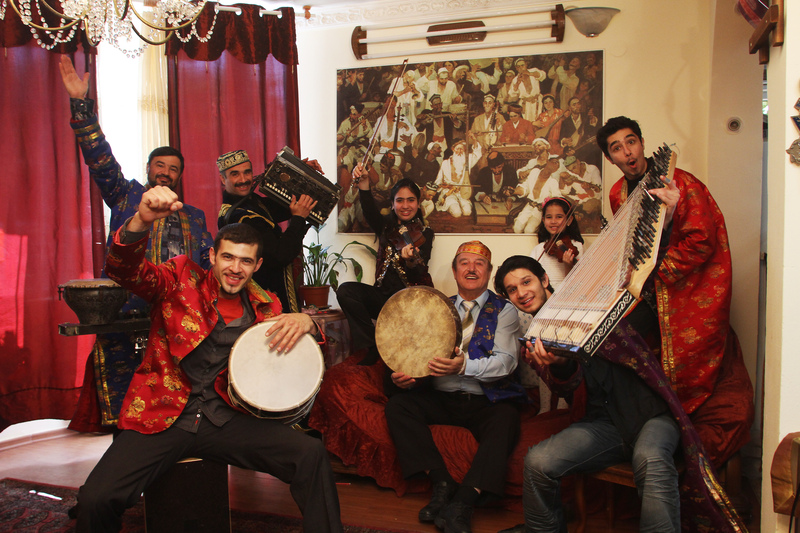 Allo Alaev has deep roots in the music of Tajikistan and the Jewish music of Buchara. Allo Alaev, a great master of percussion, took up the Doyra (a frame drum with metal rings inside), at an early age. He made rapid progress and was soon appointed the first percussionist of the folk Opera Company of the Tajikistan capital Dushanbe where he toured and performed for 50 years. Allo Alaev composes pieces for percussion, manages playing on up to 9 drums at the time and has forwarded this dance- percussion virtuosity to his children and grand children. The entire Alaev family emigrated to Israel in 1991. Allo accomplished to continue the tradition in the family and has made this ensemble well known to all Israeli families, by numerous TV programs –host shows and continuous concerts in Israel and abroad..
An ensemble of three generations of virtuosos perform together on stage and create a happy feast of colors and music, where rhythms are dominant. The presence of the younger generation makes this a true cross over from the old to the new. I would like to thank you for a concert at Pohoda 2012 festival! It was my favourite! You guys were amazing! I had “goose bumps” almost whole concert. You deserve big respect for what you are doing. Myself, as a DJ mostly playing balkan & ethno music, I have to admit again – mp3 will never be as good as real musical instrument. Same day I went to concert of Orbital but I was bored…energy comming from your performance was so strong that any other concert afterwards was just a “joke”! Any plans comming back to Slovakia? Do you have a CD I can buy online? We would love to come back to your beautiful country. We just hope the heatwave will pass by than. Our nearest show to Slovakia, must be Prague on the 25th July in the Acropolis venue. or you can try also to buy physical cdfrom http://www.xangomusic.com/ from Netherlands..
, you can check out – . Anyhow we are happy if you play our music. I am very excited about seeing you at WOMADELAIDE in March 2013. Bring it on. Ich bin froh, den text hier zufällig gefunden zu haben. Dieser Text war sehr faszinierend. finde auch das Homepage Design sehr wunderbar.